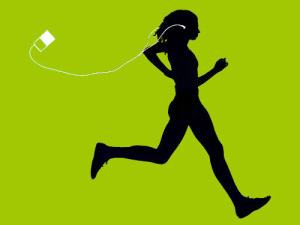 Last week I found myself thinking about the effects of listening to music while exercising. I run a lot but have never listened to music while doing so. The reason I guess is that I want to listen to the cadence of my feet and hear ambient sounds around me for safety reasons. My attention is diffuse enough as it is–I don’t need more distraction! Maybe music with a half-time, 90-95 bpm tempo would be my ideal running soundtrack? (BTW: You can hear a half-time, 81 bpm feel in the Guy Called Gerald Track too: drum ‘n’ bass always had those two layers of musical time going on.) The music would have a lot of delay effects thrown in too to up the dub quotient. By the way, my walking pace is just slightly faster than this half-time pace, falling in the 105-108 bpm range. A recent Wall Street Journal article discusses research on the optimal tempo for workout music as being between 125 and 140 bpm “when people aren’t trying to time their movements to the music.” Music with this tempo–such as a lot of contemporary pop–has been found to reduce one’s sense of fatigue as well as boost motivation. And when we do synchronize our movements with the tempo of the music (whether fast or slow), the sounds can increase endurance–our wherewithal to keep going– by altering our emotions and attitude just like any stimulant. The findings of this research, says David-Lee Priest of the University of East Anglia in England, is that music is well-designed to divert our attention away from whatever “unpleasant feedback” exercise presents us with by way of a neurological mechanism. Music interferes with transmission of unpleasant sensations from exercising, such as having difficulty breathing, sweating or stiff and tired muscles.